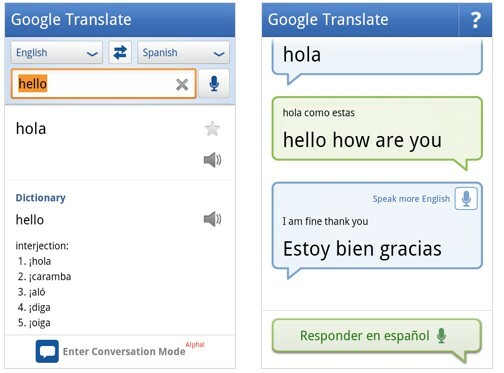 Finalement la traduction instantanée en live arrivera bien plus tôt que ce que j’imaginais… Google vient en effet de présenter la nouvelle version de son application Google Translate pour Android qui permet d’avoir une conversation avec une personne ne parlant pas votre langue. Sur le principe le téléphone capte le son de votre voix et traduit en live dans la langue de votre interlocuteur et bien entendu cela marche dans les deux sens. Je prends le pari que dans quelques années on pourra parler à un japonais sans avoir eu à apprendre la langue. Pour l’instant l’application ne permet que d’avoir des conversations entre anglais et espagnols et cela se télécharge sur l’android market si vous avez un téléphone fonctionnant sous Android bien entendu. There is ten days, j’had evoked the project Share Your OPML which makes it possible to know which reads what and which are the sites most consulted by the means d’un flow rss (techcrunch in this case). Feedcollectors is another project which has the merit versus SYO (Share Your OPML) to d’avoir designé by a true designer, c’est beautiful, propre… a little buggé nevertheless (upload of too large list OPML, upload of photograph which does not become pas…d’ailleurs by writing these some lines the site is down). There is ten days, I had evoked the project Share Your OPML which makes it possible to know which reads what and which are the sites most consulted by the means of a flow rss (techcrunch in this case). Feedcollectors is another project which has the merit versus SYO (Share Your OPML) to be indicated by a true designer, it beautiful, cleanâ¦ is buggÃ© a little nevertheless (upload of too large list OPML, upload of photograph which does not passâ¦ besides while writing these some lines the site is down). Feedcollectors is another project which has the merit versus SYO (Share Your OPML) to be indicated by a true designer, it beautiful, clean… is buggé a little nevertheless (upload of too large list OPML, upload of photograph which does not pass… besides while writing these some lines the site is down).